You’ve Done Well Accumulating Wealth. Are You Prepared to Spend It Down? We’ve all heard the story of Icarus, who flew on wings of feathers and wax until he got too close to the sun. What happened next was something Sir Isaac Newton would codify into a natural law centuries after Diodorus wrote the iconic tale. Think of yourself as Icarus as you are now accumulating wealth. There will inevitably come a point when your wings will give out and you will begin a financial descent. The question is not whether it will happen, but rather, will you make a controlled descent, or fall flat? When you retire, your accumulation period usually ends and your income will likely dip. We call this the “black out” period. At age 70 ½, your RMD (Required Minimum Distribution) period, or “spend-down period”, begins. This is the age at which the government mandates RMDs so it can finally tax those gains from tax-deferred accounts, such as your IRA, 401k, etc. Will there be enough for you and your spouse? How much will be left for your children? How charitable do you intend to be in these final years? The time to ask those questions is not in your 70s. It’s now. We have found that, while the individuals who come to us with retirement questions are often smart, forward-thinking people, they tend not to be aware of some of the strategies they could be putting in place that will make their spend-down period far more successful. The key is understanding the tax nature of your investments and putting the assets in the right place as early as possible. An easy way to visualize this is with the concept of “buckets”. We often have clients come to us with a variety of assets (cash, bonds, real estate, equities, etc. ), and they are intermixed in a variety of accounts which are usually taxable, tax deferred (IRA, 401k) and tax free*. Too often, investors lump all these assets together. By doing so, they are missing out on some great tax planning opportunities. That’s why you must organize your assets into two buckets: taxable accounts and tax-deferred. Asset location is really important. Here a few ground rules to follow. Ground Rule #1: If it makes sense to hold fixed income (e.g. bonds), hold that in your IRA/401k (tax-deferred). In general, fixed income should go into tax-deferred accounts whenever possible. These accounts – the IRA, for example, if structured correctly – will likely grow slower than the taxable account, thus minimizing future RMDs. With fixed assets, most of the growth comes from interest (rather than from appreciation, which is how equities grow). If you had these assets in a taxable account, the tax you pay on the interest every year would be an impediment to growth, as it cuts into compound interest potential over time. Even tax-free municipal bonds should go first into your tax-deferred accounts. Bottom line, it makes more sense for these slow-growing assets (bonds) to be the ones taxed at regular income rates in your future RMD period, rather than the ones (equities) that will likely be worth far more at that point. Ground Rule #2: If it makes sense for you to hold equities (e.g. stocks), hold them in your taxable account. Equities have historically grown faster than fixed income, so you want to take advantage of the preferred capital gains tax rate and step-up in cost basis. Equities should go into taxable accounts so you can take advantage of the comparably lower capital gains rate now rather than pay the ordinary income rate on RMDs later. The more you have accumulated in tax-deferred accounts, the higher the RMD calculation will be, and the more you’ll pay in taxes in retirement. In addition, the assets you expect to pass down to beneficiaries when you die should optimized. IRAs in general are not great as the RMDs continue after the Grantor’s death. They can be “stretched” if structured correctly, but the beneficiary is still required to continue the RMDs. On the other hand, taxable accounts get to have their cost basis stepped up. That means that the gains on these assets will not be (income) taxed. Here’s how it works: A stock, for example, that began at value X and ended at value Y would normally be taxed on the gain, the difference between current value (Y) and the cost basis (X). Y-X = gain. But when the cost basis is stepped up, it becomes Y. No gain, no tax at the time of death of grantor. So, if a stock was worth $100 and grew to $1,000, it would normally be taxed on the gain – current value of $1,000 – cost basis of $100 = $900 if you sold it. But after you die, the cost basis for your beneficiary becomes $1,000. Current value is $1,000. So, the gain = $0. Remember tax deferred accounts are just that. At some point the government wants their money. Imagine losing huge swaths your hard-earned income every year to taxes on high income RMDs when you’re years past working age. 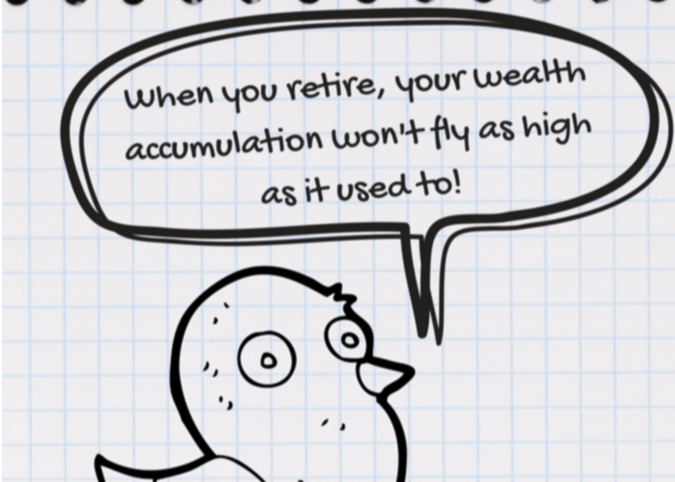 Roth IRAs are really great because they grow tax free so you want to always put your growth orientated assets (stocks) in your Roth IRA first, if you have one. There are also planning opportunities to convert some of your IRA into a Roth IRA in low income years, which happens during the black-out period. Ground Rule #3: If it makes sense to hold international equities (e.g. international stocks), hold those in your taxable account to be able to deduct any foreign tax credits. This is fairly self-explanatory. If you want to take advantage of tax credits on assets, they need to be in taxable accounts. Those credits can make a meaningful difference over time. This is just another example of why understanding the tax implications of your buckets is so vital. This is just a brief overview of strategies to plan for a successful spend-down period. There are many strategies we recommend to clients depending on their specific situation, needs and goals. The most important takeaway for clients from these discussions is the concept of tax mitigation as a lifelong strategy, not primarily an annual one. It’s not about how much you pay in taxes in any one year, but how much tax you pay over your lifetime. Every strategy we discuss is built on that principle. Don’t hesitate to reach out to us with your spend-down questions. Lifeguard Wealth is here to help you pass through those final years confident your goals are more realistic, and more within reach, than the sun above Icarus’ waxen wings.